Will anyone beat Candiotti’s Cleveland mark for 200-inning seasons? Right-hander Corey Kluber, who worked 6.1 innings on June 4th in Cleveland’s 7-4 walk-off victory over Boston, has emerged as the Indians’ best pitcher in 2014, posting a 6-3 record with a 3.23 ERA through the club’s first 61 games of the campaign. With 86.1 innings so far through 13 starts, he is on pace to finish with his first career 200-inning season. Kluber, who made 24 starts in 2013, pitched a career-high 147.1 innings for the Indians last year when he was 11-5 with a 3.85 ERA. Last season, no Indians pitcher topped the 200-inning mark, with right-hander Justin Masterson (14-10, 3.45) leading the Cleveland staff with 193 innings. The hard-luck Masterson was on pace to surpass 200 innings until he was sidelined in early September with an oblique injury. At the time, he had already pitched 188.1 innings through 28 starts and would have easily gotten past the 200 mark. Masterson was forced to leave his September 2nd start against Baltimore after only one inning. He was sidelined for the three weeks before returning on September 25th. He made only three appearances upon his return – all in relief. Other than the fact that the more innings Kluber and Masterson pitch helps Cleveland win ballgames, why is the 200-mark significant? Well, the reason is that Tom Candiotti remains the last pitcher to register five consecutive 200-inning seasons in a Cleveland Indians uniform, having accomplished the feat from 1986-1990. Candiotti would have made it six seasons in a row except the Indians traded him to Toronto in June of 1991. Think about it. If not for Masterson’s injury in 2013, he would have been more than halfway to Candiotti’s streak. If Kluber gets to 200 this year, it will be his first such season – and he will have four more to go just to match Candiotti. Charles Nagy nearly matched Tom Candiotti’s record…but fell just short. Even though the Indians have had Cy Young pitchers in the recent past – such as Cliff Lee (2008 Cy Young winner) and CC Sabathia (2007 winner) – nobody has been able to match that feat in a Cleveland uniform. Lee and Sabathia, both of whom were workhorses in Cleveland, couldn’t approach that streak. Lee, for instance, managed “only” three 200-inning seasons in a four-year span during his time with the Indians. Sabathia was close, as he pitched 210 innings as a sophomore in 2002 and then 241 in his Cy Young season in 2007. In between, Sabathia logged 197.2 (in 2003), 188 (in 2004), 196.2 (in 2005), and 192.2 innings (in 2006). 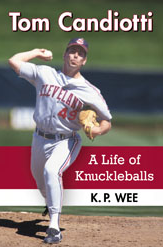 He would then pitch a career-high 253 innings in 2008, but split that season with the Indians and Milwaukee Brewers. Jake Westbrook, an All-Star for Cleveland in 2004, had three straight 200-inning seasons for the Indians from 2004-2006. Alas, he made only 25 starts in 2007 and threw just 152 innings. Prior to the streak, Westbrook had tossed 133 innings in 2003. 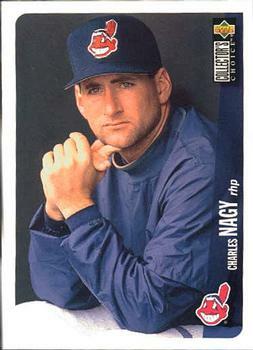 Going back a few years, Charles Nagy came the closest when he logged four straight 200-inning seasons for the Indians from 1996-1999. Since no Indians pitcher got to 200 innings in 2013, Candiotti’s record as the last Cleveland pitcher with at least five consecutive 200-inning campaigns will last for at least five more years. This entry was posted on June 7, 2014, 10:54 pm and is filed under All About Innings, Indians Baseball, Indians Records. You can follow any responses to this entry through RSS 2.0. You can leave a response, or trackback from your own site.